Point of View introduced the HDMI Smart TV dongle, a new device that turns any TV into a Smart TV. The kit consists of a wireless keyboard and a HDMI dongle with Google Android 4.1, it features a dual-core ARM Cortex A9 processor running at 1.6GHz, Mali 400 GPU, 1GB DDR3 memory, and a MicroSD memory card reader. The HDMI Smart TV will retail for 99EUR. POINT OF VIEW, well known for its range of NVIDIA graphics cards and Android tablets is announcing today a new product in their line-up, the HDMI Smart TV dongle with wireless keyboard. Browse websites, watch movies, play games, download apps, enjoy social media, email, watch and show pictures. It is all possible with the HDMI Smart TV Dongle from Point of View. 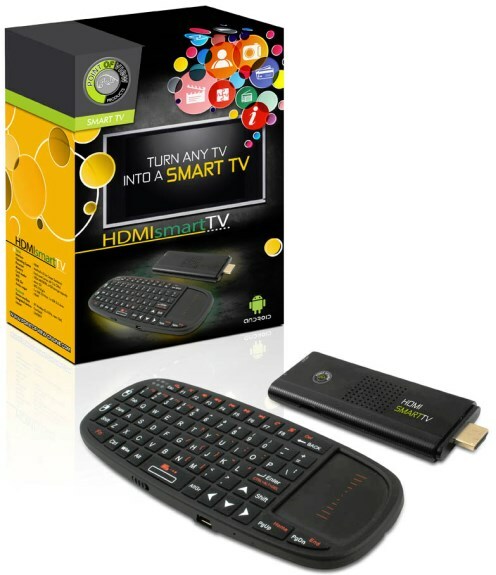 The POV HDMI Smart TV dongle is a powerful, full featured Google Android 4.1 device. It is small, light and easy to install. When installed on your TV through an available HDMI port you will be able to run online apps, stream music and videos and you can even play games on the device. The device can be connected easily to your home network using the built in Wifi connection. The used processor is a dual core Cortex A9 running on 1.6 GHz accompanied by a quad core Mali 400 GPU and 1024 MB of DDR3 system memory. This engine is guaranteed to run all your favorite apps on any size of television. The Smart TV HDMI dongle will be available with Android 4.1 Jelly Bean and a special multimedia launcher. It comes with the Google Play store Pre-installed. Together with the HDMI Smart TV dongle we also deliver a wireless QWERTY keyboard with trackpad, the keyboard can easily be installed to the available USB connection and will give you all the controls you need to turn your TV into a real smart TV.